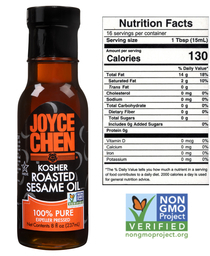 Joyce Chen Sesame Oil is a must have essential item for every home cook's Chinese pantry. Unlike other products on the market that blend sesame oil with cheaper oils, our Kosher certified product is 100% pure. It adds a rich and nutty last minute* finishing touch to your new recipes, and favorite dishes, soups, salad dressings, and marinades. For a delicious restaurant-style dipping sauce, add a dash of Joyce Chen Sesame Oil to our Joyce Chen Mild or Spicy Dipping Sauce, along with scallions or cilantro. *Sesame oil should not be used in deep frying or high temperature cooking, since it would smoke due to its low burning point. Replace your bland everyday oil and dramatically improve the taste and aroma of any stir fried or grilled vegetables, seafood, or meat. 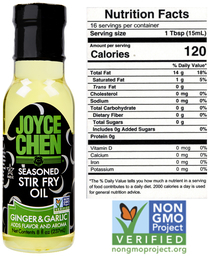 Joyce Chen Garlic & Ginger Seasoned Stir Fry Oil is perfect for conveniently creating delicious Chinese recipes. By infusing essential oils of garlic and ginger into 100% Canola Oil, we create a product that is healthy, well balanced and flavorful, without being over powering. Kosher certified as pure and wholesome, our stir fry oil is trans fat free, and cholesterol free.